• Anti-bacterial and anti-fungal, helping to prevent infection and odours. 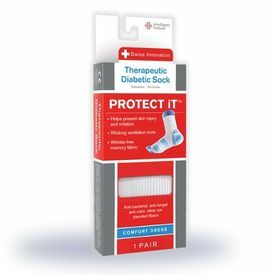 • PROTECT iT socks have been developed during years of research in collaboration with podiatrists, surgeons, certified diabetes educators (CDEs) and other medical professionals. • PROTECT iT socks help prevent the complications of at-risk feet unlike any other sock available.